Born in Los Angeles, to a Jewish family, Ritts began his career working in the family furniture business. 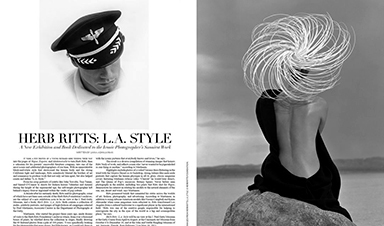 His father, Herb Ritts Sr., was a businessman, while his mother, Shirley Ritts, was an interior designer. He moved to the East Coast to attend Bard College in New York, where he majored in economics and art history. Later, while living in Los Angeles, he became interested in photography when he and friend Richard Gere, then an aspiring actor, decided to shoot some photographs in front of an old jacked up Buick. The picture gained Ritts some coverage and he began to be more serious about photography. He photographed Brooke Shields for the cover of the Oct. 12, 1981 edition of Elle and he photographed Olivia Newton-John for her Physical album in 1981. Five years later, he would replicate that cover pose with Madonna for her 1986 release True Blue.